Your introduction to Amateur Radio. The FCC Technician License exam covers basic regulations, operating practices and electronics theory, with a focus on VHF and UHF applications. Morse code is not required for this license. 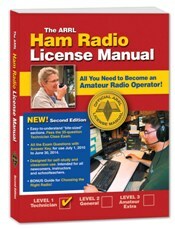 With a Technician Class license, you will have all ham radio privileges above 30 MHz. These privileges include the very popular 2-meter band. Many Technician licensees enjoy using small (2 meter) hand-held radios to stay in touch with other hams in their area. Technicians may operate FM voice, digital packet (computers), television, single-sideband voice and several other interesting modes. You can even make international radio contacts via satellites, using relatively simple station equipment. Technician licensees now also have additional privileges on certain HF frequencies. Technicians may also operate on the 80, 40 and 15 meter bands using CW, and on the 10 meter band using CW, voice and digital modes.